View from outside the British Queen Pub to the Railway Hotel on the corner on Newport Street. Both pubs have been demolished. I remember in the 50s and early 60s Jack Francis. Who is Stu Francis dad used to sell newspapers on the windowsil near the ladder. His other son Jack used to help him. We used to be on our way to catch the no.12 bus which went past Brackley colliery. 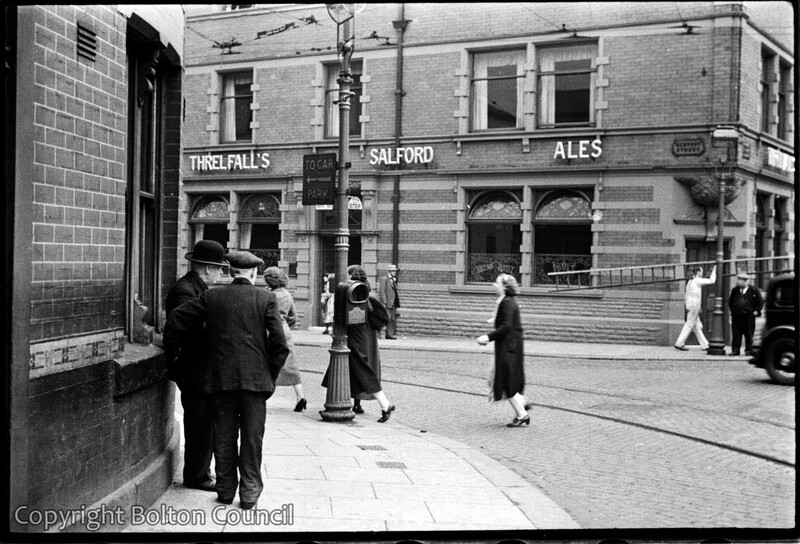 sir, having noticed the threlfall Salford ales sign and being of a curious nature, I would wonder whether little Bolton, CITY of BOLTON, and BMBC are in the real deal a certain Salford north ? Uncle Bob Harwood and his wife Nelly held their wedding reception at the Railway hotel. Does anyone remember or know of a chemist shop in Newport St once owned by the Hart family? the only Harts chemist I know of was on Market St, Bolton. This was a small street running between Hotel St and Deansgate. In the early 70s I worked at Boots Chemist on Victoria Sq and we would often send customers seekin old fashioned remedies to Harts. At that time the shop still had all the original wooden shelving and drawers, and the window display was also old-fashioned. It was Hart’s Chemist until it finally close down in the mid / late 1970’s. It was just 35 yards from my front door. I lived at 6 Byng Street West one of three homes in the street. Owned by the Threlfalls Brewery. The Manager and Part Owner from approx. 1956 to closing was Mr. Baldwin. The finest, most gentleman chemist ever. He headed the Montserrat store ( the shop is still there today) under another name. It is located at 114 Montserrat Road above Doffcocker. Mr. Baldwin fought Town Hall housing Manager to get me and my pregnant wife into the flat above 114. My family owe everything to Harts Chemist. I lived in 6 Byng St West which was across Newport St.
Harts was a great and busy place. It was run by Mr. Baldwin. Truly the nicest guy I ever met. True and Gentle Man. He let us rent his chemist apartment up Montserrat on the Johnson Fold Estate. The only requirement was that my wife had to work there. So she worked Mon thru Fri mornings 9:00a. to 12:00 noon. I don’t know whether or not you knew any history of Harts Chemist. They actually made and advertized their own products. Quite an achievement at the early part of the century. The row of buildings of which their Town Chemist was in built in the 1860’s and due to its proximity to the Train Station they garnered a host of out of town customers, whom I was told would make special trips to get Harrt’s own brand. Great days…great store…Great memories. My uncle Joe Donahue and his son Brian and me ( the lackey) concreted the cellar floor 1958. Across from the two blokes by the British Queen ( the guy with the ladder is walking) by the first window sill. That is where Jack Francis sold his newspapers. Jack was a lovely man and worked so hard every day of his life. Jack unfortunately died quite young. And the selling spot dried up. I lived diagonally (on that whole block) from Jacks Corner at 6 Byng Street West. Shortly after Jack died there was NewManagement took over the Threlfalls Railway Hotel at which was Jacks Corner and they refused to allow a continuance from there window ledge. They had run the Rawson Arms (nicknamed “Stump”) in Farnworth for a couple of years. I was barman for them for 3years at “Stump”. They were miserable people but seemed to improve their disposition after taking on the Railway Hotel. Tragedy struck when as a childless couple, getting on in years, they adopted a little black orphan boy just 3 years old. They went on vacation and early one morning they awoke to find the little chap not in his bed. After a frantic search hotel personnel found him drowned face down still in the reeds and standing water, having fell off a walk ramp during the early hours of that first day of vacation. Does anyone know why the Rawson Arms was called ‘The Stump’ ? The Landlord and Landlady were named Dawson. After hours and cleanup we sometimes chat for hours. They told me that it was nicknamed stump because the landlord once was the assistant hangman ” Harry Allen” they had met Harry at victuallers banquets. The Stump’s upstairs room was the Masonic Lodge and Harry Allen I was told was a high 33 degree Mason and a Past Master. The Dawson’s told me Harry had told them about the last female hanged in Britain 1956 I think, her name was “Ruth Ellis”. The hangman Albert Pierpoint ( the hangman) had screwed up the drop weight and Ruth’s internal organ’s prolapsed. She should have been trussed up around her female parts and was’nt. Harry Allen was present when this happened. Her error caused a major outcry against the death penalty in Great Britain. Since the innocent guy’s non-campus mentus was greatly diminshed, the testimony was self incriminatingshould and should have been remove from the record to “non -relevancy”. I hope you find this knowledge helpful. The Dawson’s transferred to the Railway Hotel Threlfalls House on the corner of Newport Street and Trinity Street.